The contemporary 2-bedroom 3-bathroom house is tasteful and simple-lined yet fully furnished and very snug. Located less than 1 km from Kamala Beach, Villa Phawta is an ideal summer home for a family with children or two couples. The contemporary 2-bedroom 3-bathroom house is tasteful and simple-lined yet fully furnished and very snug. 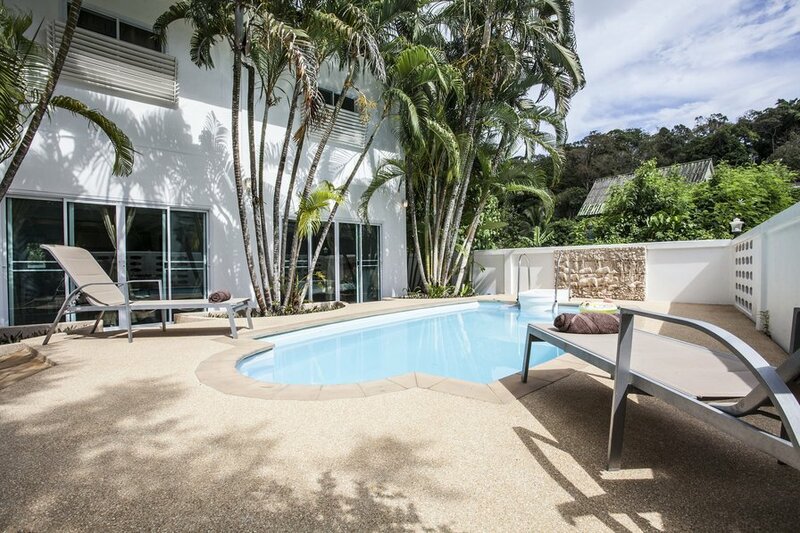 The large private garden featuring sunbeds and a private pool, in addition to a separate BBQ outdoor space, makes for a flawless lounging spot during sun-filled Phuket days. Kamala Beach is on the west coast of Phuket, favourite amongst families with small children because of its warm waters and lots of open space for sports and activities. Although not nearly as busy as famous Patong, Kamala is located just north of it so both Patong Beach and Bangla Road with many shopping and nightlife attractions are a mere 15-minute car trip down the road. Another close by beach is upscale Surin with its famous beach clubs like Zazada Beach Club, Diamond and Catch. Adding to the sense of ultimate holiday relaxation, the two bedrooms each have air-conditioning, wardrobes, en-suite bathrooms, safety boxes and 40 inch TV sets placed in front of the bed. There are two en-suite bathrooms with showers, waterfalls and 2 sinks each, as well as one more toilet. The private pool also features an open-air shower for maximum convenience. The open plan kitchen that extends to living and dining areas is equipped with all comfort necessities, from kettle and toaster to oven and dishwasher. It also boasts a lovely white-toned breakfast bar for 4. Living and dining rooms are open plan together with the kitchen, and all furniture in them is modern and stylish. The dining room table sits 6 persons while the living room has a restful sofa in front of a large flat-screen TV with a DVD player. The area opens up to the sizable pool garden and separate barbecue space with another dining table for 4. The 6-seat-dining table is between the loungue and kitchen.